Your full year of coaching, Performance-based Hiring certification, and 24/7 Resource Portal access starts with Performance-based Hiring for Recruiters Onsite! "Truly a tremendous amount of practical knowledge is presented in the four sessions. It was useful to learn not only from Lou and Bryan, but to also learn from those attending the sessions - very interactive and effective!" The challenges facing recruiters are increasing at a rapid pace. Performance-based Hiring for Recruiters and Managers will help you meet these new challenges head-on by providing the latest tools, techniques, and ideas on what it takes to hire top people. Designed for both corporate and third-party recruiters, Performance-based Hiring for Recruiters will teach you the skills and techniques to source, assess, and recruit top active and passive candidates. You'll be able to apply these principles on your next search assignment. Click the "Dates & Times" tab above for additional information. This program is approved for HRCI recertification credits. Performance-based Hiring for Recruiters Onsite can be scheduled at your convenience, given the availability of our expert trainers. This class is usually delivered in a full-day program, but can be split into two half-day classes for a small fee. The full-day Performance-based Hiring for Recruiters Onsite class lasts a full 8 hours. The standard timeframe is 8am to 5pm (with an hour for lunch). However, those 8 hours can be adjusted earlier or later if needed. The cost of the full-day Performance-based Hiring for Recruiters Onsite class varies depending on number of attendees, duration (one day or two half-days), location, etc. To request an estimate, please contact us here. "Lou Adler offers a level of detail in his training that surpasses any other program that I have taken. He gives real-life instruction for typical and extreme recruiting situations. All professional recruiters should attend this training." Performance-based Hiring for Recruiters is taught in four distinct sections that take recruiters through every step of the hiring process. Using Performance Profiles to Understand Real Job Needs: This section covers taking the assignment, how to partner with hiring managers and the preparation of the performance profile. Sourcing Active and Passive Candidates. In this segment recruiters learn how to maximize their active sourcing programs and how to identify, recruit and network with passive candidates. In our workshop, the training will focus only on the area of sourcing most important for the recruiters that will be attending the class. Using the Performance-based Interview to Recruit and Set-up the Close. During this session participants learn the basics of interviewing and how to use the interview to increase candidate interest. Participants also learn how to lead panel interviews and debriefing sessions. Both techniques help minimize hiring mistakes while increasing assessment accuracy. Advanced Recruiting, Negotiating and Closing. This segment addresses the basics of applicant control – essential to recruiting top performers, overcoming basic objections, creating the opportunity gap, how to make and test offers and negotiating the close. Everyone who attends a live or Performance-based Hiring for Recruiters training program is automatically enrolled in our Performance-based Hiring recruiting community. All members receive access to The Hiring Machine our new Performance-based Hiring Self-paced Learning System, and one-year, 24/7 access to our Resources Portal, plus personal coaching to become Performance-based Hiring certified. In addition, members can attend any online Performance-based Hiring Recruiter workshop throughout their year of membership. We also have special low renewal rates for alumni of Performance-based Hiring for Recruiters. This is your training and tools dashboard. Becoming Performance-based Hiring certified is the key to becoming a better recruiter. We have a real coach reviewing your recruiting project work and providing advice and counsel. During your first year of membership, or annual renewal, you’re invited to attend any online Performance-based Hiring for Recruiters program. "Lou is a dynamic presenter and full of knowledge and enthusiasm. It's only the first session and I have already learned new tools, techniques and approaches to improve upon what I am already doing as an experienced and successful Senior Recruiter. I am excited about the next three weeks and am glad to be participating." Lou Adler is the CEO and founder of The Adler Group – a training and search firm helping companies implement Performance-based Hiring℠. Adler is the author of the Amazon top-10 best-seller, Hire With Your Head (John Wiley & Sons, 3rdEdition, 2007). His most recent book has just been published, The Essential Guide for Hiring & Getting Hired (Workbench, 2013). He is also the author of the award-winning Nightingale-Conant audio program, Talent Rules! Using Performance-based Hiring to Hire Top Talent (2007). Adler is a noted recruiting industry expert, international speaker, and columnist for a number of major recruiting and HR organization sites including SHRM, HRPA, SMA, ERE, LinkedIn, and HR.com. Bryan Johanson is the COO of the Adler Group, a consulting and training company specializing in hiring process reengineering. He has been consulting and training for the last 8 years with companies as diverse as Mellon Bank, Royal Canadian Bank, Kinecta Federal Credit Union, Arby's Restaurants, Panda Restaurant Group, REI, and the YMCA of the USA. His previous career includes over 15 years experience in management, the majority of which has been in high technology sales and marketing. His leadership experience in start-up companies and Fortune 500 companies has provided him with a unique perspective on the issues of hiring top talent. Prior to The Adler Group, Mr. Johanson has held positions including Executive Vice President of POWER Hiring, Vice President of Sales and Marketing for Enfish Technology, Director of Channel Programs and Services for Novell Inc., and Director of Channel Programs and Strategies for WordPerfect Corporation. Bryan is the father of eight children and lives and works in Parker, CO.
"I conducted my first interview since attending your class. I followed your instructions by the book. Your system is exceptional. Not making an immediate first impression unto itself can be a crash course in personal introspection, prejudices, preferences and thought patterns. Your class, followed exactly as taught and laid-out, provides the best interview platform I've experienced. It was really enjoyable for me to grow and learn after 15 years of interviewing." Why take Performance-based Hiring Training for Recruiters? What do I get with the full course (four module/class) purchase? The course is delivered by a LIVE webinar and telephone conference-line or VOIP. It’s a very dynamic format. We keep the class size limited so everyone can participate and create a dynamic and rich learning space. What's the difference between the Online and Onsite classes? Both Online and Onsite classes deliver the same Performance-based Hiring for Recruiters content - but the delivery method changes. Each format offers exercises and breakout sessions that are unique to that learning environment. Both classes are highly interactive. Online attendees are connected to our expert trainers and other students via a conference line or VOIP connection, as well as a virtual classroom. These classes have all the interactivity of in-person training, but from the convenience of your desktop. Both classes offer the same level of coaching, the same opportunity to become Performance-based Hiring Certified, the same eLearning Center, and the same level of additional tools, resources, and benefits. You can register online or email info@louadlergroup.com for a registration form. How will I get my receipt and registration information? After you’re registered, we’ll send your receipt via e-mail. Then you’ll get course instructions by e-mail, some materials will be downloadable, and others you’ll receive at your shipping address, which you provide when registering. It’s no problem. You can make it up. Do I always have to start with the first module? No, though we recommend you begin with the first or second module, which are about Defining the Job (creating a compelling job) and Talent-centric Sourcing. Do you have on-demand online training? Does The Adler Group give a certification? Yes, we can give a recognizable professional certification. 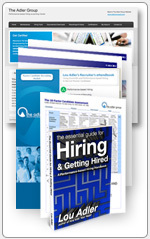 The Adler Group is an HRCI (Human Resources Certification Inst.) approved Provider. Performance-based Hiring Training for Recruiters is approved for up to 16 credit hours that can be used toward your PHR, SPHR, and GPHR recertification, as well. Performance-based Hiring alumni are also eligible to receipt up to 1.6 credit hours towards their NAPS recertification. Our certification allows alumni to utilize the "Adler Certified" logo on their website and other marketing collateral. Performance-based Hiring: Recruiters and HR professionals who attend all four modules of Performance-based Hiring for Recruiters Online & On-site, and successfully complete the required homework, receive certification in Performance-based Hiring. Those who achieve certification receive a personalized certificate (suitable for framing), and may use the Performance-based Hiring Certified logo on their website, resume, or other marketing collateral. 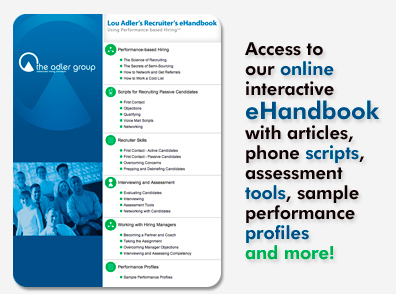 Attendees of Lou Adler’s Master Course for Recruiting Passive Candidates Using LinkedIn are eligible to receive 8 credit hours toward PHR, SPHR or GPHR recertification. The Adler Group is recognized by SHRM to offer Professional Development Credits (PDCs)for the SHRM-CPSM or SHRM-SCPSM. This program is valid for up to 16 PDCs for the SHRM-CP or SHRM-SCP. For more information about certification or recertification,please visit www.shrmcertification.org. NAPS: Attendees of Performance-based Hiring for Recruiters Online & Onsite are eligible to receive up to 1.6 credit hours toward NAPS re-certification. NAPS awards re-certification credits according to the following formula: 10 hours of continuing education activity = 1.0 CEU. HR Professionals are required to obtain 5 CEUs in every three-year period to maintain their NAPS certification status. HRPA: Recruiters and HR professionals who attend all four modules of Performance-based Hiring for Recruiters Online & On-site, and successfully complete the required homework, are eligible for 10 HRPA Recertification Points.